Real estate chatbot is becoming popular. This is because clients and prospects have changed the way they communicate. In the past, major communication takes place through email and phone calls but nowadays communication is shifting towards SMS+MMS text messages and messenger apps like WhatsApp and Facebook Messenger. The truth is, real estate prospects and clients desire a communication process that is convenient, fast and mobile-friendly. This is where real estate chatbot is a necessity on Facebook Messenger. Below are the benefits of using a real estate chatbot for your business. Real estate chatbot offers better conversion rates than you can get on a landing page. Why use Facebook for your real estate chatbot? The reason Facebook is a good platform for real estate chatbot is that it is the platform where your clients and prospects already spend most of their time. It is also popular. In fact, there are 1 billion active monthly Facebook messengers users. The best part of it all is that 67% of consumers expect to chat with a business. Therefore, real estate chatbot is a perfect way to communicate with your clients and prospects because they are already eager to connect with you on Facebook. Now, that you know the benefits of using real estate chatbot, how do you create a messenger bot for your business? There are two ways to create your real estate chatbot on Facebook. You can build a real estate chatbot using the Facebook Messenger app, which involves a knowledge of coding. The second method you can use to create a real estate chatbot is using a chatbot app such as ManyChat. This is easy to set up and you need not know how to code. The first thing you need to do is to define the purpose of your chatbot. In this regard, as a real estate business, you will want to use real estate chatbot to get the contact information of your prospects so you can follow up with them to turn them into a lead and clients. Once you have their details, you can follow up with them one on one. You can also use the real estate chatbot to educate your prospect and sell your real estate projects. Second, before you can use the real estate chatbot, you will need to know the relevant questions prospects ask. You can search the past messages you received from prospects in your Facebook Messenger. You can also check your FAQ page to discover popular questions that bother your audience. The third thing you need to create a real estate chatbot is your Facebook fan page. This is where your real estate chatbot will live. You cannot use your personal profile or Facebook Group for a messenger bot. Now, you know what you need. It is time to create the real estate chatbot. We will start with the Facebook method. The first thing you need to do to create a real estate chatbot using Facebook is to create a Facebook app. The Facebook app is available on the Facebook developers page. Go to https://developers.facebook.com/quickstarts/?platform=web (shown below). b Click on “skip and create app ID“ to get started. On the next page, you will see the list of different Facebook products displayed. Select the Messenger (as seen below) and click on the “set up” button. On the next page, generate a token. Select the Facebook page you want to use and copy the token. Still on the same page, scroll down to Webhooks. Click on “set up webhook”) button to create and enable webhooks. You will get the callback URL and verify token you need to set up the webhook. Once you are done with setting up the webhook, you can now submit your messenger bot for review. Facebook team will test your bot for compliance with Facebook guidelines. You can publish your real estate chatbot when it is approved. You can configure it to show on your Facebook page, on your website, emails, online ads etc. The second method you can use to create real estate chatbot is the chatbot app – ManyChat. Unlike the Facebook method above, ManyChats is easy to set up and you don’t need a coding knowledge to do it. You can do it with a few mouse clicks. One great thing about ManyChat is that it has more features than the Facebook Messenger bot. These features can help take your business to the next level. They include content delivery, integrations with other apps such as Zapier, automation, broadcasting, growth tools, and live chat. 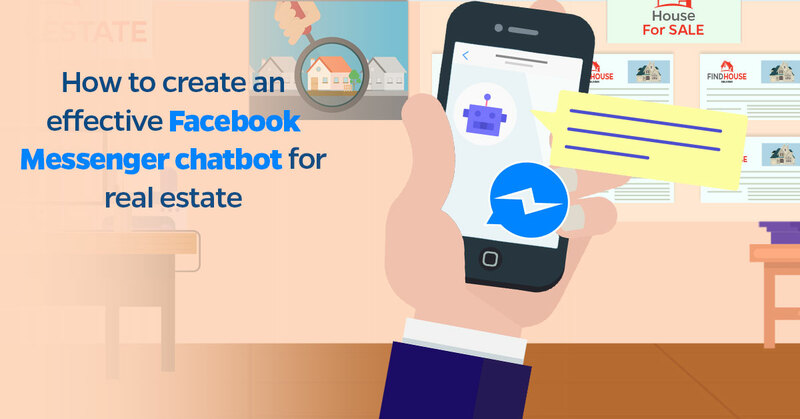 To create your real estate chatbot through ManyChat, follow the steps below. Go to the homepage and click the get started button as shown below. 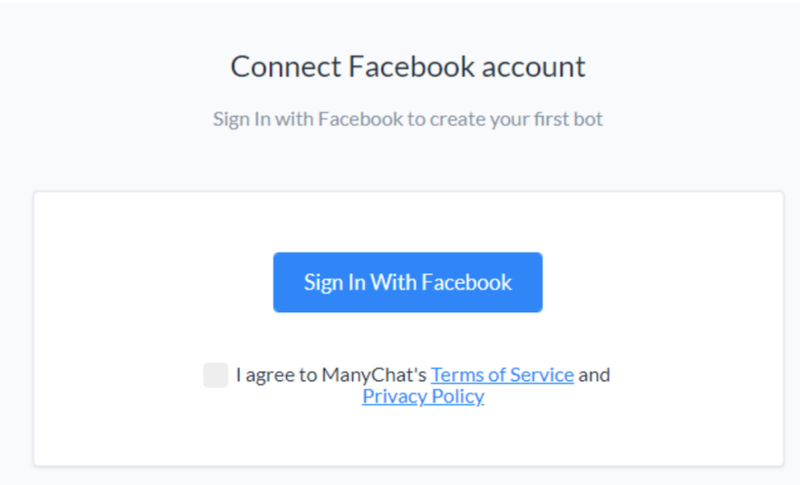 It is time to connect to your Facebook page so that Manychat can access and manage it. It will not post anything on your page without your permission. Click “Sign in with Facebook”. Once you have granted the permission, it will walk you through the set-up. You now have access to your ManyChat dashboard where you can edit your messages and settings and receive information about your prospects. This includes their names and when and how they sign up. When you are through with that, you will need to create your first broadcast. You can add different buttons such as send people to your website, send people to a landing page and call a phone number. Set up your welcome message. ManyChat gives you the opportunity to add different buttons to your welcome messages, such as lists, video, audio and many more. Your welcome message should include greetings for your new users and where to go next. The Real estate chatbot is a necessary tool for your business if you want to generate unending and high quality leads for your business. A lot of businesses are already using it to generate leads and revenue. If there is a right time to start using the real estate chatbot, it is now. I would like to know: Are you planning to set up your real estate chatbot with Facebook or ManyChat? P.s. Don’t miss our video tips on this topic and discover how to create a Facebook Messenger both that really converts.